Mark out a running track using cones as shown above. Markers 20yrds apart and then a further 5yrds at either end. Two teams will compete against each other and are arranged at either end. Pointed cones are better to eliminate cheating, by cutting corners. Players are split into equal teams. 6 players is minimum. The distance between the cones can be varied to suit the needs of the session, i.e. longer = more endurance based, Shorter = More Agility based. The first 2 players (B1 and A1) start 5yrds apart from each other. The coach starts the contest. The teams run in a clockwise direction looping around the yellow cones at either end. •In the diagram above, A1 chases B1 and attempts to tag B1 before B1 manages to pass the yellow cone. •If B1 is tagged before the yellow cone then that player it out and returns to their group and takes a seat. •If B1 manages to get past the orange cone, they are safe and can return to their group to go again after their other teammates have gone. 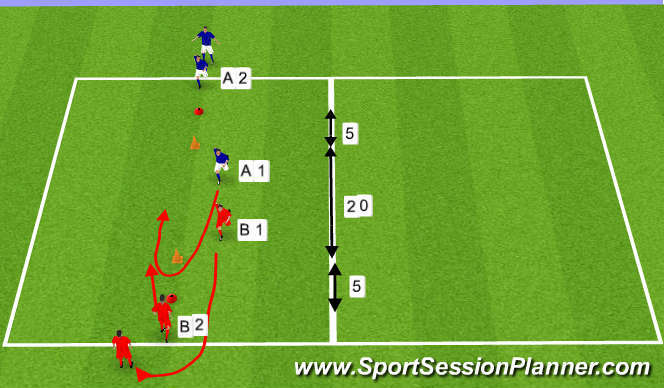 •Once A1 passes the orange cone, he/she turns and sprints to get safely back to their team without being tagged before reaching the opposite yellow cone. •Once passing the lower orange cone and turning, B2 can immediately give chase to A1 and attempt to tag him/her as shown in Diagram 2. •The game continues until one of the team is down to only one player. Game can also be played for a set period of time (i.e. team with the most amount of players remaining is the winner). The game continues until one of the team is down to only one player. Game can also be played for a set period of time (i.e. team with the most amount of players remaining is the winner). 2.Discuss acceleration techniques. Low centre of gravity, arm movement, driving knees, etc. 3.Discuss deceleration techniques. Low centre of gravity, Shift weight, driving knees, etc. 4.Quick Transitions when changing players. 1.Include quick feet activities/cone slaloms on each side to perform! 1.Increase the length of the sides to increase the endurance demands of this activity. 2.Decrease the length of the sides to increase the agility demands of this activity.